Thank Crunchie I sneaked through that last set of traffic lights on amber. ‘Or blue, to match the curtains?’ he asked hopefully. ‘Red to match the cabinets or blue to match the curtains? !’, I may have shrieked, while having visions of pulling up at our first campsite under the disapproving gaze of seasoned caravanners curiously trying to work out whether we’re a fifth emergency service or mobile brothel. 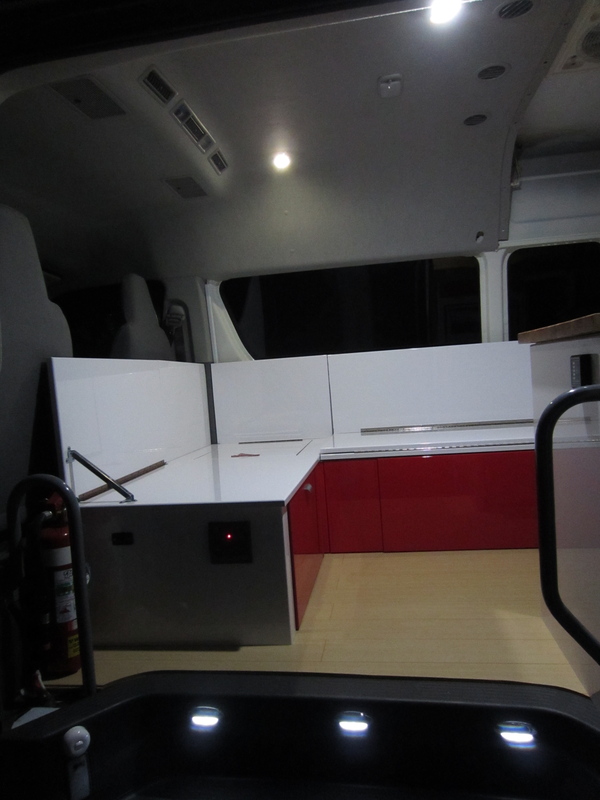 Now usually of course, the key in all successful partnerships – be they in life or in campervans – is to compromise. On other occasions, one exasperated shriek is all it takes. Without further ado (and in the rather fortunate absence of a purple lighting option) we ordered white lights. The surfer-chic dream is still alive. The ceiling lights are very cool. You operate each one individually just by tapping it – once to switch it on, another to dim it and a third to turn it off. It’ll come in very handy when we want to create our own mood zones in different areas of the van, although until I finish the curtains, romantic and atmospheric will have to be the default as the full beam is visible for miles around. On the subject of curtains, well some familiar obstacles have surfaced – namely my uncooperative sewing machine and complete lack of sewing ability. Oh to have some more cushions to tackle – they were a DODDLE in comparison. 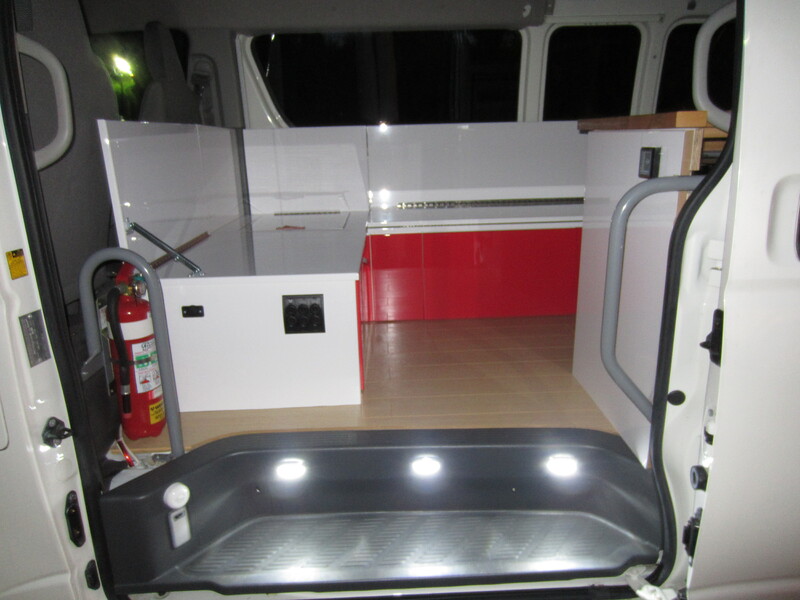 Post edited to add: if any of my fellow campervan diy-ers are still persisting with this blog in the hope of finding some useful tips (firstly, well done), we bought the lights from www.qled.com.au. They do a huge range of styles and colours. Each ceiling light is wired into the 12v battery via the main control panel, and the entrance lights are operated by their own retro switch – just to the left in the photo. 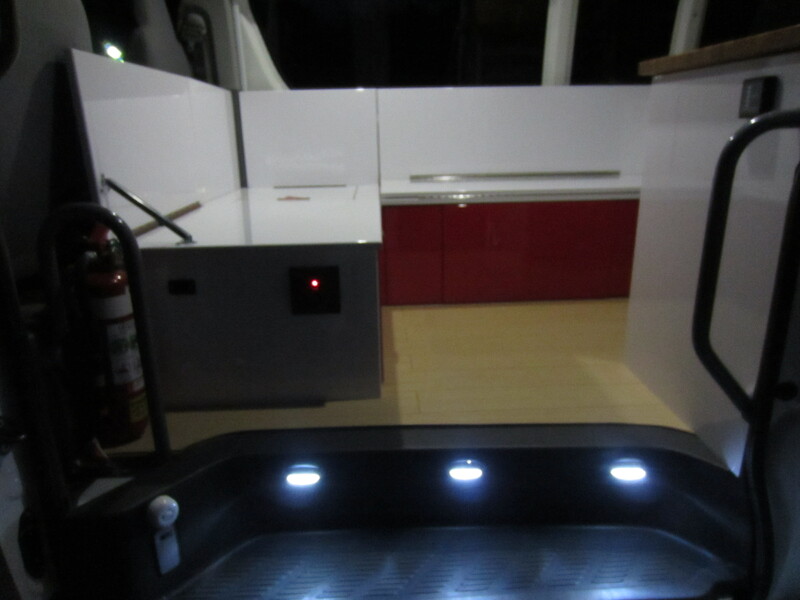 This entry was posted in Building a diy campervan, Camper lighting and tagged building a campervan, Campervan conversion project, Converting a campervan step-by-step, DIY campervan by Rach. Bookmark the permalink. I think the red light would have suited you two; that with the match stainless steel pole would get the other campers talking!!! You’re nearly finished; c’mon Rachel you can get those curtains finished within a week if you put your mind to it. Gentlemen please! This is a family blog!